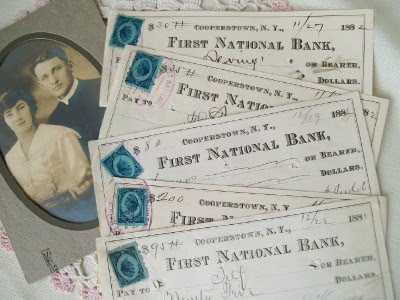 This week I'm excited about my latest finds... these are just some of them. 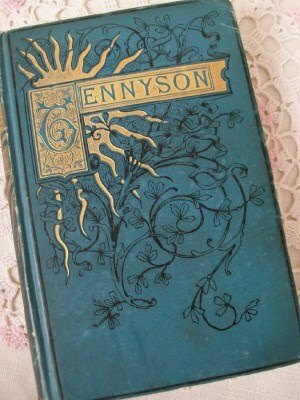 The rest may be found in my Just Listed category here. Dear Hubs gets credit for finding this one. Gorgeous artwork on these old old books. 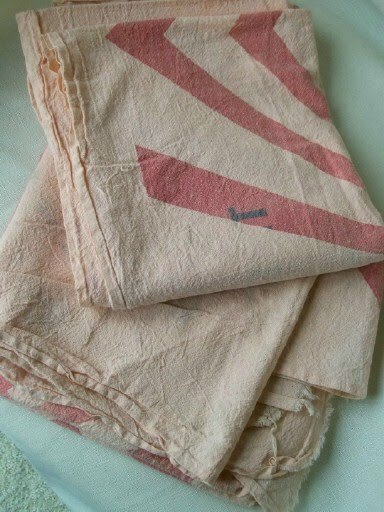 Two feed sack bags... in PINK! This was a neat find... when do you ever see them in pink? This is adorable. 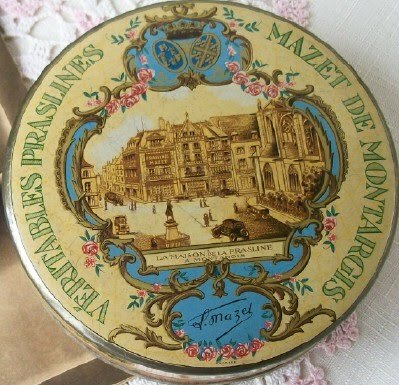 A French (Peanut Chews from Philly) tin with a scene from Paris. So sweet! 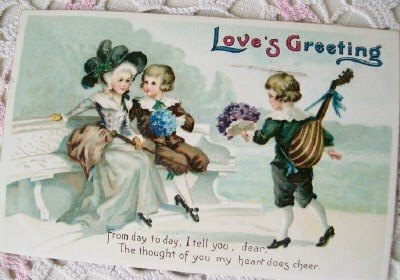 Love's greeting! With a French scene no less. I like how she has not ONE but TWO suitors. 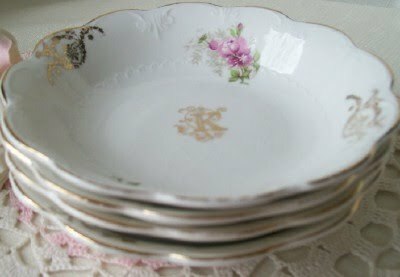 Shabby chic early vintage china berry bowls. You can do so much more with these than just fruit. Ring and pin dish on your vanity, hold odds and ends in your powder room... love them. These have a monogrammed "K" on them. Hmmmmm....maybe my Sister would like them? I was so excited when I found this little French tin! Ooooh praslines and everything French. Little teeny pink roses... ooh la la! 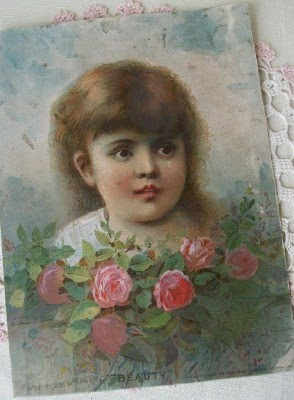 An old A&P (The Atlantic & Pacific Tea Company) advertising card. This one is titled "BEAUTY" ... I can see why! A&P had some of the loveliest art in their ads. This one is no exception. 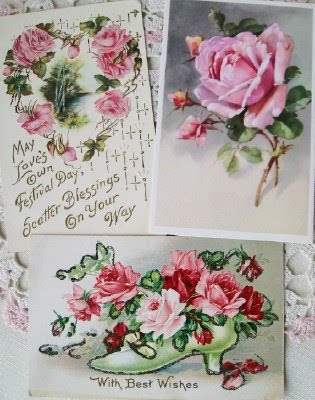 More of my favorite rose postcards...the shoe is fantastic! 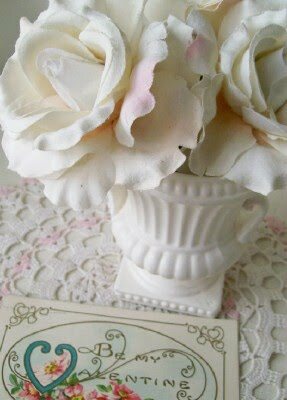 And last but not least I'm showing this cute cute little "Grecian" urn. Lots of ideas for using it: Make up brushes, pens, flowers, you name it. Sometimes it is the little "finds" that can brighten up a small spot in my house. What do you like to do in yours? Thanks so much for checking out this week's arrivals! 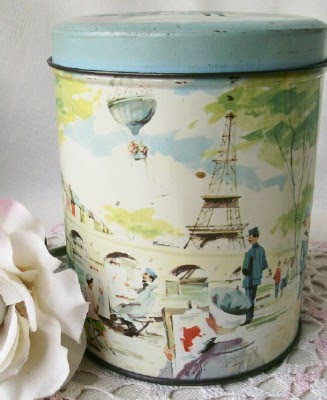 Love the parisian tins! That little urn caught my eye too! You're actually gonna sell that book? Or is it going in your collection? My favorite is the peanut tin with the Eiffel Tower. PS: You should try to link your photos of your products directly to them in your store and see how that affects sales! Hi Jillian-the tins are just wonderful! and of course I love the feedsacks too. You have a great eye for great stuff! I love the old boxes and the rooster. I collect rooster so they are always my favorites. Enjoyed your blog.